Today marks 50 years of The Daytona 500, a glorious day for race fans. This is the Super Bowl of car racing in the US, conducted at the birthplace of NASCAR. It is a day of honor and glory for men across our nation, a time where they can sit in their recliners wearing a sleeveless t-shirt, drinking beer and eating corn chips until the checkered flag is waved. But, for some NASCAR fans, this is not enough. They must make a pilgrimage to this Sacred Site of the Hemi. I took one such trip, trying to relive my teenage summers spent at Huntsville Speedway. I would sit in a plastic lawn chair, listening to the roar of the engines (and feeling it too) waiting until my uncle’s stock car lined the track. Heck, I even had a racing boyfriend at one time, so that I could get the full effect of the Race Car Lifestyle. It didn’t work out (alas! ), but it did give me a glimpse of the people behind the races. Race car fans are not just your stereotypical redneck. The majority of spectators are business owners, corporate types, and even lawmakers. If one were to judge by the drivers themselves, NASCAR is full of pretty smart marketing people. So, when I was invited to check out the Daytona International Speedway and all it has to offer, I jumped at the chance. Daytona is not just a place to go to a race; there are beaches that visitors can drive on, restaurants galore, and luxury hotels. 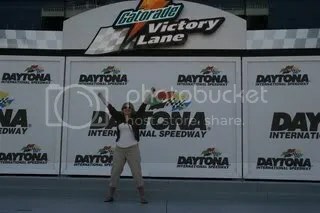 But in sticking with the theme of this post (MountainMama is going for a visit soon), I’ll educate you on things to do at Daytona International Speedway after the big race is over. The Walk of Fame – This is a free attraction along the sidewalk of Daytona International Speedway. Visitors can find their favorite driver’s tile and place their hands in the driver’s impression. VIP Hot Pass Tour – This includes admission into the Daytona 500 Experience (normally $24), a 2-hour personal tour of the speedway, lunch at the Budweiser Bistro, 2 Acceleration Alley vouchers, and a discount on merchandise in the gift shop. Ride-Along – Must be at least 16 years old. A ride-along gives you the thrill of the track starting at $135 per person. This is part of the Richard Petty Driving Experience and must be booked in advanced. The Daytona Experience – This is the grand-daddy of them all. You get to actually DRIVE a race car for 24 laps (after some training). This can run up to $2199 per person and is part of the Richard Petty Driving Experience and must be booked in advanced. No matter if you watch the Daytona 500 from your recliner or a box seat, the Daytona 500 Experience is waiting for you all year ‘round.